Home › Latest Promotions › Freedom Never Rests and neither should you. 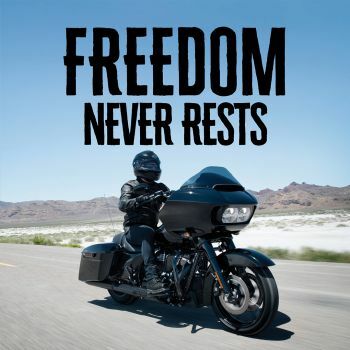 Freedom Never Rests and neither should you. Trade up your current Harley-Davidson® for an eligible MY18 Harley-Davidson® and receive up to $2,500 for Parts and Accessories* to dress up your ride. *Trade up P&A offer of AUD $500 – AUD $2,500 is available when trading in a Harley-Davidson® road registered motorcycle and purchasing an eligible new Harley-Davidson® motorcycle. This offer is available from January 1st 2018 until 11.59pm on 31st March, on eligible models only and depending on the Harley-Davidson model purchased. Offer is exclusive to purchases of 1200cc Sportster®, Softail® and Touring models. Excludes Street, 883cc Sportster®, Anniversary and CVO™ models. This offer cannot be used in conjunction with any other offer and can only be claimed when purchasing an eligible model at the listed ride away price. Offer is subject to availability and may be withdrawn by Harley-Davidson Australia & New Zealand at any time without notice. ©2017 H-D or its affiliates. HARLEY-DAVIDSON, HARLEY, H-D, and the Bar and Shield Logo are among the trademarks of H-D U.S.A., LLC.